The highly conservative image of bmw, its infrequent model changes, and its devotion to its original concept bmw has used transverse flat-twin power units since the first r32 was built in 1923 could lay the munich firm open to the accusation that its stuffy. However, nothing could be further from the truth. Bmw has often headed some of the most dramatic developments in the evolution of motorcycles. Logical evolution in contrast to the japanese marques, bmws strategy is not to emulate successes but to concentrate on the logical, functional evolution of its models, to create without copying. One of its most fundamental steps was made in 1976 with the launch of the r100 rs, a sportsgrand touring bike where, for the first time on a machine produced in large numbers, the fairing was not just a bolt-on accessoiy but an integral part of the bike. integral fairing curiously enough, throughout motorcycling history fairings at first a simple aluminum shell, then a fiberglass molding, and now made from plastics and frames have always been poor relations. 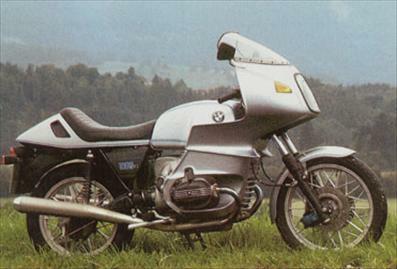 With the bmw r100 rs, the abs fairing became for the first time an integral part of the machine. There was a high level of finish on its internal face including a fully equipped instrument panel and excellent aerodynamics developed in the pininfarina wind tunnel. The tunnel trials enhanced the bikes performance while giving the rider levels of comfort and protection which remain the standard today. The clean, functional lines of the bmwr100 rs still look modern, nearly two decades after its launch.